Emma Morano celebrated her 117th birthday on Tuesday. Friends, neighbors and her doctor joined Morano in her small apartment home in the northern Italian mountain town of Verbania. She blew out three candles on her birthday cake. Each candle represented a number in her age. "I hope I don't have to cut it," Morano joked. "She dressed up and she was very proud," said her long-time doctor, Carlo Bava. "She posed for a photographer, and even asked if her hair looked good." "I am happy to turn 117," Morano told those attending her party. She received a greeting from Italy's president, Sergio Mattarella. He wished her peace and continued good health. 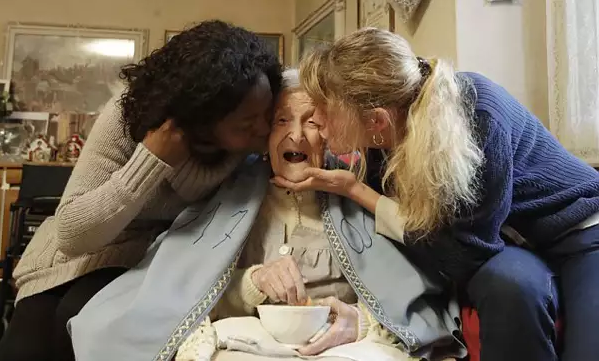 Emma Morano is thought to be the last living person born in the 1800s. She outlived all her brothers and sisters, including one who died at age 102. Her doctor noted that when Morano was young, people used to say she was weak and often sick. "Yes, yes," she said. The world's oldest person told the Reuters news agency that while she is lucky to have lived so long, parts of her life were "not so nice." She worked in a factory until she retired at age 65. Morano once told a reporter that the first man she planned to marry was killed in World War One. Then, at age 26, she was forced to marry a man she did not love. She said the man threatened to kill her if he did not marry her. She had a son, but the baby died after just six months. She said the marriage was not happy and her husband was abusive. She kicked him out in 1938 and has lived alone since then. Emma Morano says one of her secrets to living long is eating at least two uncooked eggs every day. Her doctor credits Morano's long life to her unusual diet, her genes and positive outlook on life. They blew out the lamp and began to talk. I want fruits and a birthday cake. Good health depends upon good food, exercise, and getting enough sleep. 1. "She dressed up and she was very proud," said her long-time doctor, Carlo Bava. You don't have to get dressed up for this party. 2.Her doctor credits Morano's long life to her unusual diet, her genes and positive outlook on life. The book did credit to the writer.